Monday March 8th 1920 I cleaned up my room and put things away in my wardrobe. I finished Edith mittens in afternoon and began [illegible] for a sheet for Hattie. She was in town. Wrote May. 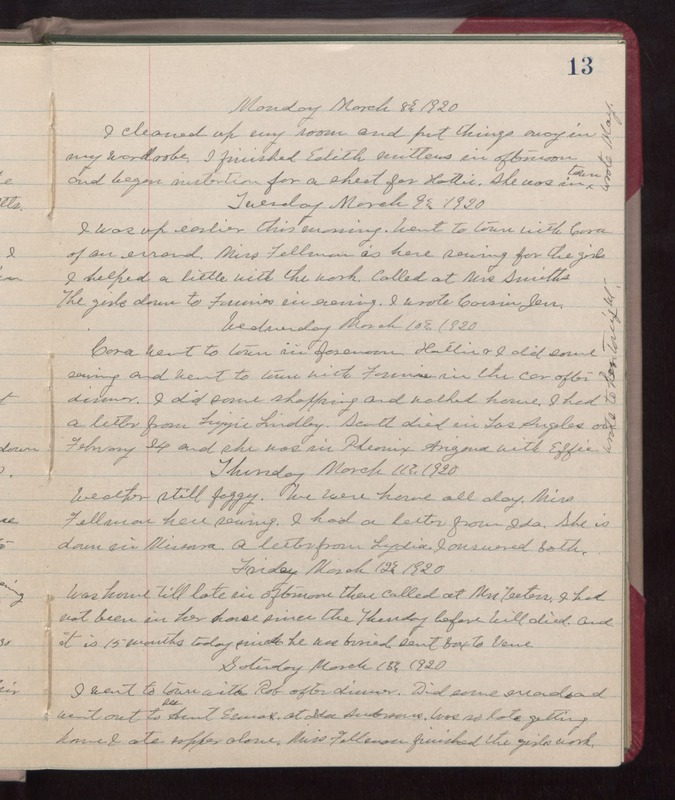 Tuesday March 9th 1902 I was up earlier this morning. Went to town with Cora of an errand. Mrs Fellman is here sewing for the girls. I helped a little with the work. Called at Mrs Smiths. The girls down to Fannies in evening. I wrote Cousin Jen. Wednesday March 10th 1920 Cora went to town in forenoon. Hattie & I did some sewing and went to town with Fannie in the car after dinner. I did some shopping and walked home. I had a letter from Lizzie Lindley. Scott died in Los Angeles on February 24th and she was in Phoenix, Arizona with Effie. Wrote to her tonight. Thursday March 12th 1920 Was home till late in afternoon. Then called at Mrs Teeters. I had not been in her house since the Thursday before Will died and it s 15 months today since he was buried. Sent box to Vene. Saturday March 13th 1920 I went to town with Rob after dinner. Did some errands and went out to see Aunt Emma at Ida Andersons. Was so late getting home I ate supper alone. Miss Fellman finished the girls work.